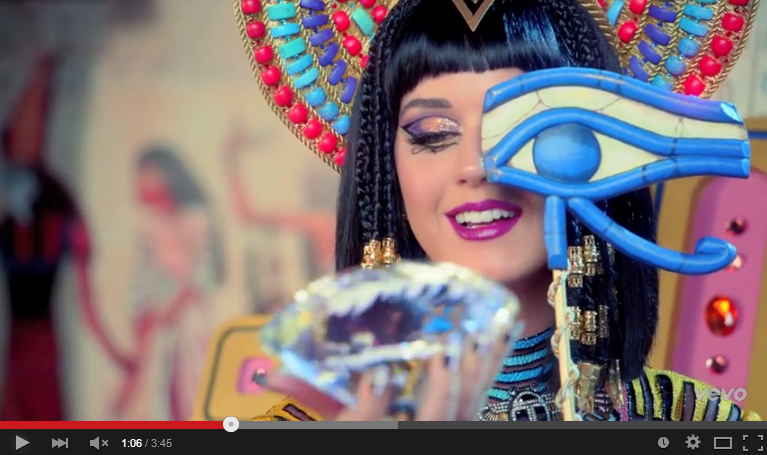 There are so many occult references in the mega hit music video Katy Perry – Dark Horse. I took on a personal challenge to explain them all to you. 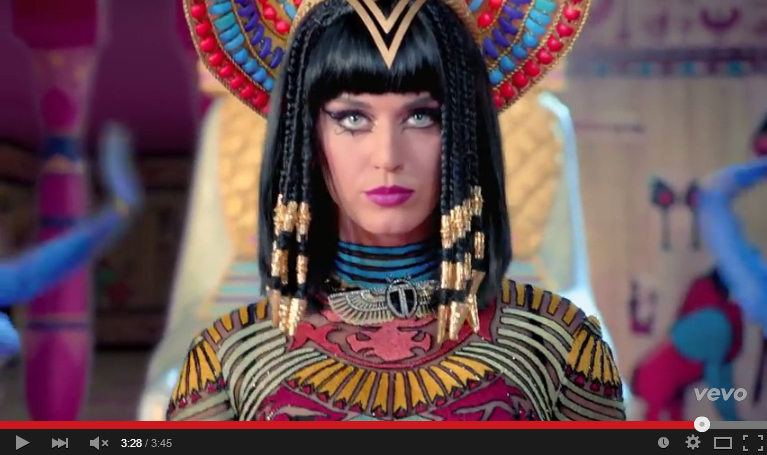 You will not find a better breakdown of Dark Horse on the internet. 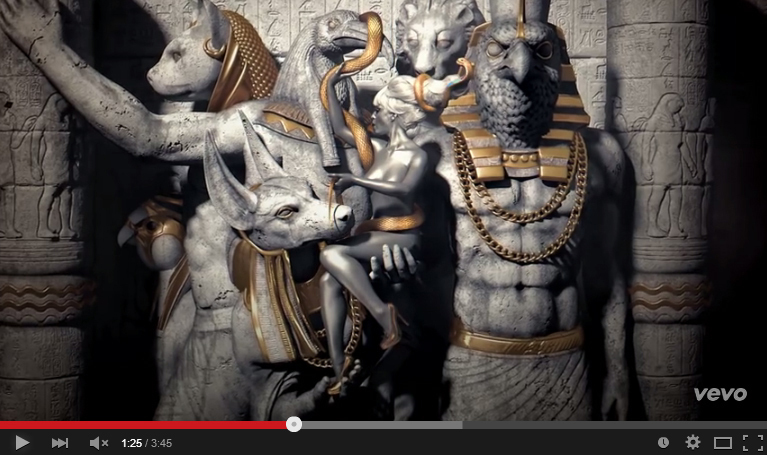 The Dark Horse music video is the definition of mainstream. 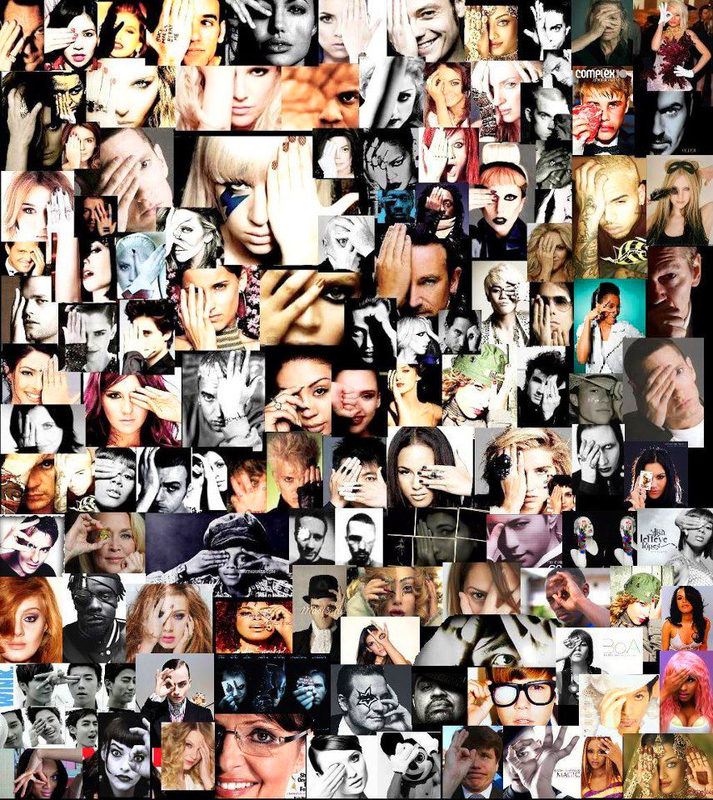 The true meaning of the symbolism is light years away from mainstream. The video has been consumed more than 975,000,000+ times. That is not an exaggeration. Who amongst us can speak intelligently on the meaning of all this symbolism? Can you? In a few minutes you will be able to. That is certain. 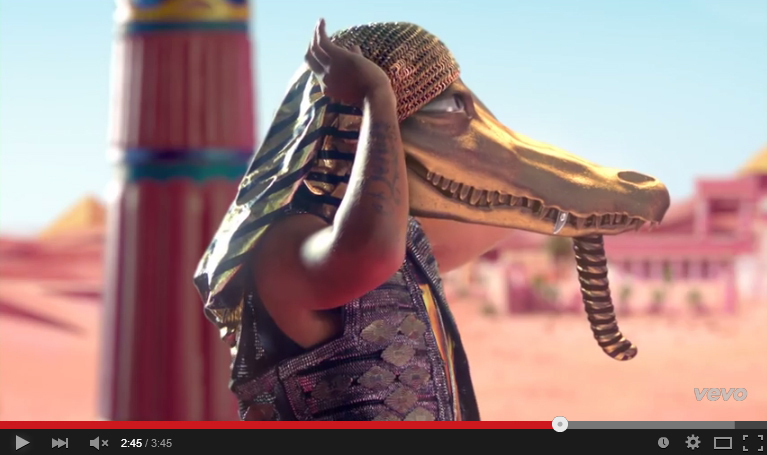 At 39 seconds we have the wadjet hairstyle. Lets be thankful it never caught on. I just explained the wadjet in detail above. I see the giant wadjet. 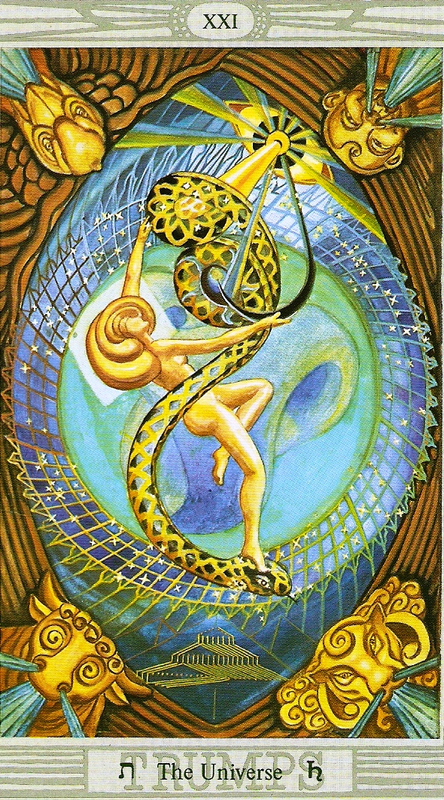 Who doesn’t see the giant wadjet? Do you see the pagan bull-god hood ornament? I do. There are several animal gods of the zodiac that have been worshiped as idols from ancient times to current day. They are the bull, the lion, the goat, and the ram. See my explanation of bull-god symbolism in my car logos post. 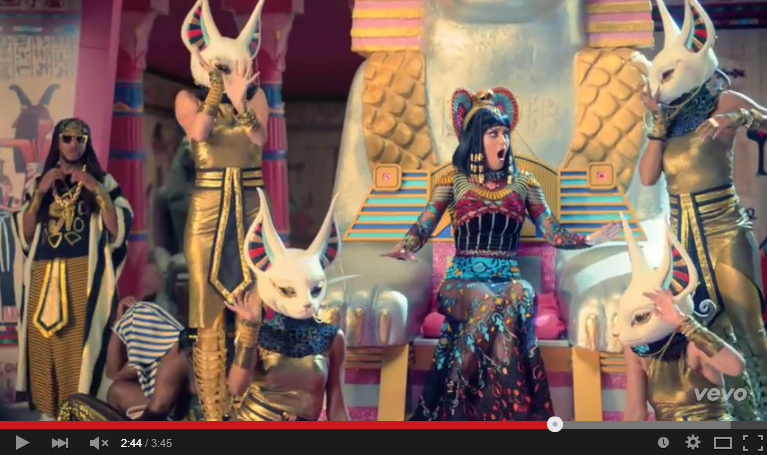 Here we have two Bast cat-god servants worshiping Anubis. He is the Egyptian guardian of the dead from the underworld associated with embalming and funeral rites. 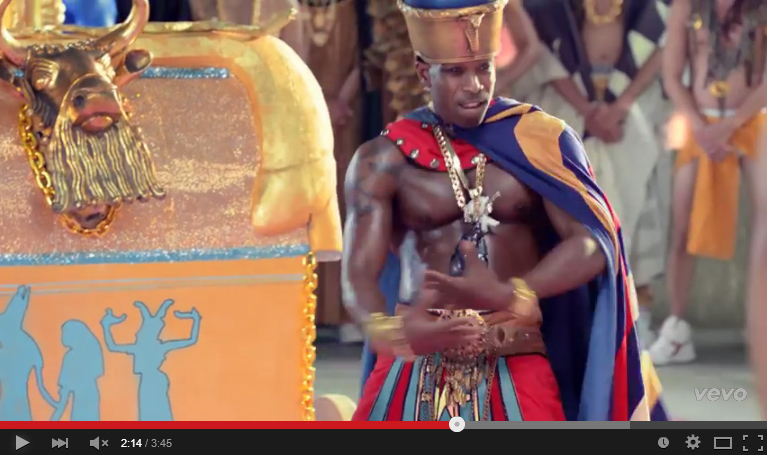 In this scene we have an Anubis casket. Juicy J is inside. Soon he will emerge from the casket of Anubis. You don’t just emerge from an Egyptian Anubis casket without having some kind of occult meaning behind this. This is a full-blown Anubis incantation. Likely a ritual to become possessed by the spirit of Anubis. Do you doubt the ritual worked? 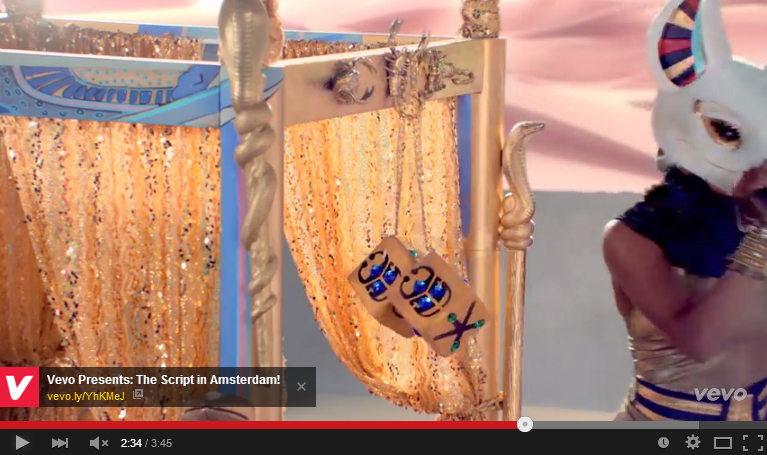 This music video has 975,000,000+ views. Some force is behind that kind of promotion. You may have just watched a demon summoning ritual. That is the reality of the situation. Think about that for a little while if you must. Did you notice the belts of the servants are indicative of phallus worshiping? I did. One of the suitors unmasks himself to reveal his identity. His identity is yet another Egyptian god. That Egyptian god is Sobek. He is God of the Nile, the Army, military, fertility and of crocodiles. Wadjet on the dance floor. Bronze serpents in the background. Author of Trip Into The Supernatural and Luciferian defector Roger Morneau saw Nehushtan worship with his own two eyes by the Luciferians when he was recruited to worship with them in Montreal. You can learn a lot from him. Pick up a copy of the Trip Into The Supernatural for a truly excellent read (I do not get paid for that link as this website is not monetized in any way). 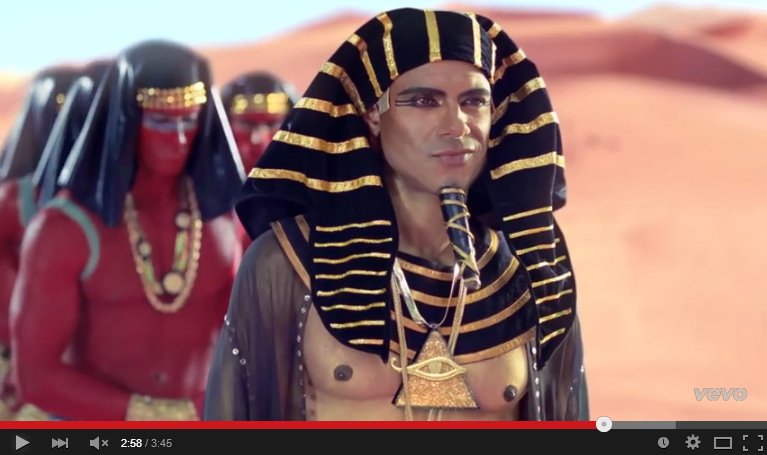 Here we have the suitor approaching with the wadjet necklace. The notable part about this necklace is the wadjet’s place in the triangle. Once the wadjet is in the triangle for me it takes on the symbol for The Grand Architect Of The Universe (TGAOTU). 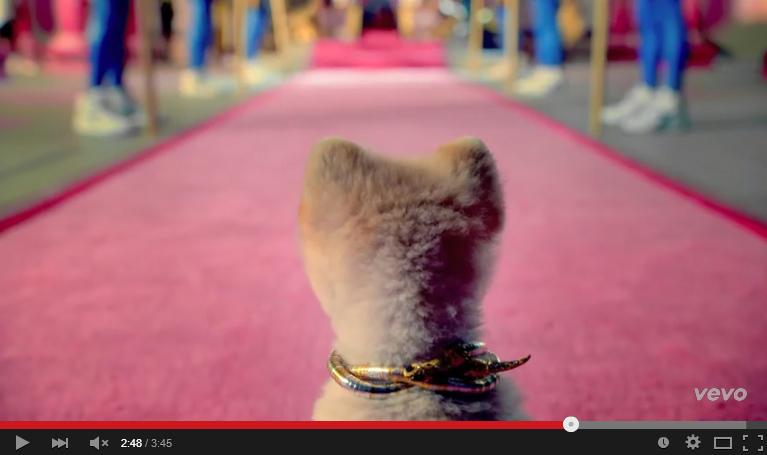 This suitor comes offering a kingdom to Katy Perry. She can then take her place on top the pyramid and she is thrilled to do so. I will devote an entire blog post just to that concept. It is that important. When I do I will link it here. 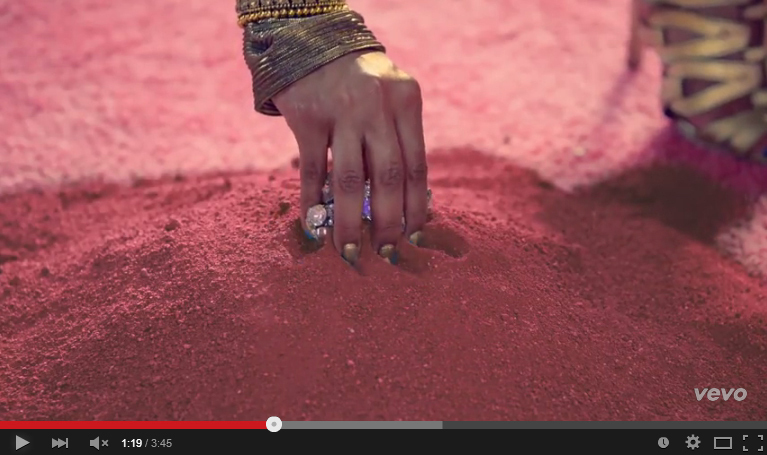 Katy Perry takes her place on the capstone of the pyramid. It is an important topic. I will cover it in detail in its own blog post coming up soon. When I do I will link it here. Notice the winged disc amulet (of which we have discussed the wing disc earlier). Notice the “T” in the center. 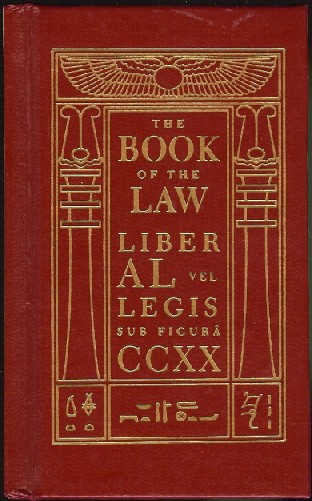 Is it a stretch of imagination to imagine the “T” stand for the Thelema religion of which its texts feature the winged disc on top of most book covers including two Crowley works The Book of the Law and The Vision & The Voice? I have never set red powder on fire but I imagine that if red powder were burning it would look a lot like this cloud. Remember when we talked about the red powder earlier? This is the red powder burning. It is red steam. We will talk about this in-depth in a future post. I will link to it here when I do. I will likely come back and add more details to this post. Stay tuned.